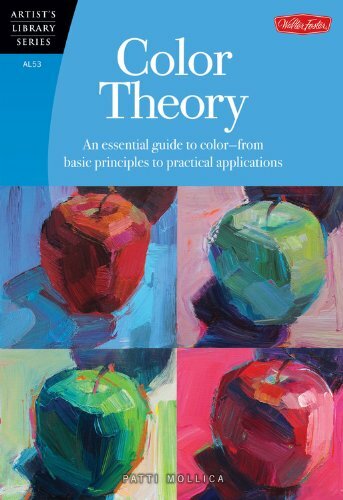 Color Theory by author and artist Patti Mollica (website | blog) is a quick guide to colour theory. The book is quite thin at 64 pages and it only packs the essential information you need to know about colour. It covers the basics of colours, i.e. the hue, saturation, value aspect, colour schemes, temperature, wheel, etc. It also talks about the pigments and colour mixing. And for the painting section, the topics are on light and shadow, colour and mood, styles and composition. The book is written in an engaging manner, simple and concise, and are accompanied by beautiful examples. At only 64 pages, it is not in depth and you'll certainly want to learn more. The medium used are oil and acrylic medium, mainly acrylic, but the color concepts are similar to watercolours as well, even if application and techniques are different. The color fundamentals are covered well, but rather briefly. So this book is more of a starter guide to beginner artists.